Spread salt and pepper on the lamb shoulder, and brown in the hot oil in a Dutch oven. Remove the shoulder. Add onions,mushrooms, carrot and celery and sauté for five minutes. Add garlic, sauté for two minutes. Add lamb stock, tomatoes and the spices. 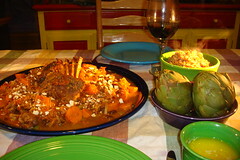 Return the lamb shoulder to the pot, cover and cook in oven at 450°F for one and a half hours. Cover the apricots and raisins in a bowl with boiling water, let sit while the roast braises. Add to the pot after the hour and a half is up, cooking without the lid for 15 more minutes. Toast the almonds in a dry hot skillet. Garnish the dish with the toasted almonds when served.